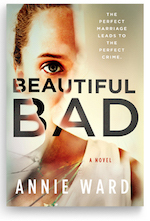 Readers who like unreliable narrators are in luck with Annie Ward's deliciously unsettling Beautiful Bad, which contains not one, but two unreliable narrators to keep everyone on edge until the very last page. And the third lead character can't be trusted, either. The psychological thriller opens 12 weeks before the main event, with wife and mother Maddie, her face badly damaged from a recent incident, planning to see a therapist without her husband's knowledge. Cut to the next chapter, titled "Day of the Killing," which unfolds like a scene in a spine-tingling suspense movie--character tiptoeing down the stairs into a dark basement; something horrifying is ahead but you can't look away. The chapter starts with a call to 911. When the dispatcher answers, a child is shrieking while a woman whispers for him to go upstairs. And then the woman screams for help and the line goes dead. An officer races to the address where the call originated, hears yapping dogs in the backyard, peeks through the front door--and sees "a red mess in the middle of the room." The officer knows she's supposed to wait for backup before entering, but her priority is the child inside who's possibly in danger. She enters the house alone, "to see what unspeakable thing has happened here." Back to Maddie, now 10 weeks earlier, giving her therapist a long list of her fears: whenever her young son, Charlie, cries; when her husband, Ian, drinks or doesn't wake up; ISIS; drowning; "the darkness in some people"; and finally "[t]hat something is wrong with me." Maddie is currently residing in Kansas with her family. But back in 2001, she lived in Sofia, Bulgaria, teaching English to students and writing travel books. Maddie often visited her best friend Jo, who worked with refugees in nearby Macedonia. That's where Maddie and Jo met Ian, a bodyguard for the British ambassador. Ian was always texting his girlfriend back home, but from the start, chemistry sizzled between him and Maddie. Maybe with Jo, too? Throughout the years, as the conflict in the Balkans intensifies, Maddie, Jo and Ian navigate the ups and downs of their relationships, the pressure of their jobs and devastating personal losses, trying to hang on to their sanity and humanity amid horror. All three eventually leave Eastern Europe, bringing home ghosts that won't stop haunting them. After the early chapter with the officer at the house that portends nothing but dread, Ward takes her time unfolding the histories of her three lead characters, starting at the beginning of their friendships and bringing them up to the day of the killing. Against the vivid backdrop of the Balkans--readers can almost feel the heat and taste the dust--Maddie and Jo get high on danger. The more the Macedonian border guards warn Maddie to stay away, the more she keeps coming back. But she wasn't born intrepid. Ward reveals a harrowing incident in Maddie's childhood that made her defiant toward death, though perhaps the experience damaged Maddie more than she realizes. Her friendship with Jo becomes strained at one point, each woman feeling betrayed. The reason for Jo's behavior is eventually explained--and it's a shattering one. Jo and Maddie are prickly and mercurial and sometimes make questionable choices, but they're always believable as they deal with the obstacles in their lives. Ian's behavior after being in war zones is no joyride, either. He's desperate to move on, to build a picture-perfect domestic life with Maddie in her Kansas hometown. He buys them a house and takes up painting miniature models. But Maddie knows there's a darkness and unspeakable depth to his pain: "With trembling hands and squinting eyes, he gathered up the tiny parts of those dismembered soldiers and carefully glued them together... and painted them with bright colors to bring them to life. And then splattered them with blood." This scene unnervingly captures the complicated nature of post-traumatic stress disorder. Ian is big and unpredictable; when triggered, he can transform from loving to menacing on a dime. Ward is careful, and skillfully so, to portray him as someone in need of sympathy and care. Maddie's heart breaks for him, but at the same time she's scared of her own husband. Her feelings expertly illustrate the beautiful and the bad in their relationship.